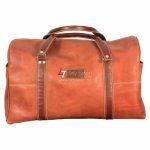 This small holdall has been designed for everyday use or short travels. This small holdall has two fixed handles. The main body of the holdall has a large zip in order for the wider opening and the zip pullers are attached to the main body with kissing buttons. 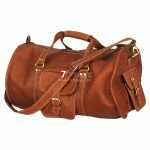 This small holdall has two wide inner zip pockets opposite of each other for convenient storage space. There are two spacious flap pockets on the front; this cutting edge design combined with high functionality creates a very muscling travel piece.